Plus, Man City close in on multiple records and more Premier League talking points. Liverpool are in the Champions League final, but they have yet to secure their place in next year's competition. LIVERPOOL HAVE JUST survived their biggest game of the season, progressing into the Champions League final at Roma’s expense on Wednesday. Yet this weekend brings another important match, as they travel to face Chelsea at Stamford Bridge. A win will guarantee the club a top-four finish that might be needed for the Reds to qualify for next season’s Champions League. A loss, however, would leave their hopes of competing next year in Europe’s premier club competition uncertain. Fifth-place Chelsea currently trail Jurgen Klopp’s side by six points, though they have a game in hand on their rivals. Should the hosts win this weekend and defeat Huddersfield on Wednesday, only goal difference will separate the two sides. If Liverpool then drop points against Brighton on the final day and Chelsea win their last Premier League game at Newcastle, the Anfield outfit will face the unusual situation of having to beat Real Madrid in the Champions League final in order to qualify for next year’s competition. Tottenham, of course, also need to perform to secure a top-four finish, with fourth-place Spurs still having West Brom, Newcastle and Leicester to play. And for those wondering, a Liverpool fifth-place finish and Champions League triumph would not see a repeat of 2012, when Chelsea claimed the European trophy and thus qualified for the following year’s competition instead of fourth-place Spurs. Uefa have since altered their rules, meaning both English clubs would gain entry to the competition in any hypothetical repeat scenario. While Man City have been confirmed as champions for a while now, they hardly can be accused of taking their foot off the pedal as the all-conquering club have continued their winning ways of late. They face Huddersfield on Sunday, knowing they need to score just two more goals to break the Premier League record (103) set by Chelsea in 2003. Before then, the Tottenham 1962-63 side scored a similarly impressive 111 during that campaign (though it was a 42-game season), and City surpassing that achievement is also far from inconceivable. Other records are also expected to be broken. Defeat of the relegation-threatened Terriers will see them secure a record 31st Premier League win, equalling the all-time tally set by the 1960-61 Tottenham team, while victory would also see them earn a Premier League record of 96 points. 3. Can West Brom continue remarkable run? Since Darren Moore has been appointed caretaker manager, West Brom have played with the kind of passion and purpose that has been absent for much of their campaign. The club, who are still almost certain to go down, are unbeaten in four matches since Moore took charge, gaining an impressive win over Man United and a draw against Liverpool during this period of resurgence. They still appear doomed though, as if Swansea beat Bournemouth, the Baggies will be relegated regardless of what happens in their game this weekend. They also face a Tottenham side that they have beaten just once in their last 16 Premier League meetings, with Spurs needing a victory to boost their hopes of Champions League qualification. This Sunday, Arsene Wenger will take charge of Arsenal at home for the 606th and final time. There is no escaping the fact that it has been a disappointing season. The North London club are set for a sixth-place finish at best, and their Europe League exit on Thursday ensures Wenger will be denied a glorious trophy-winning end to his lengthy Gunners reign. They play a Burnley side who only trail them by three points and could yet finish ahead of them in the table — an indication both of how well the Clarets have performed and how far the Gunners have fallen since the glory years. Regardless, Wenger is expected to receive a respectful send-off this weekend — after more than 20 years at a club where the good times unquestionably outweighed the bad, it is the least the revolutionary French manager deserves. 5. Can Brighton consolidate Premier League status with a famous victory? Brighton have faced Man United 18 times in their history, emerging with a win on just one occasion. Most football fans will struggle to remember that game. Peter Ward scored the all-important goal during a league match in 1982. United were managed by Ron Atkinson at the time, and their team that day included Kevin Moran, Frank Stapleton, Norman Whiteside, Bryan Robson and Gordon McQueen. 36 years on, the Seagulls will be hoping to emulate that feat against Jose Mourinho’s side this evening. Although they currently sit 14th, they have not guaranteed their Premier League survival, but a win or even a draw should see them over the line realistically if not mathematically. Against a United side that look likely to finish second and with an FA Cup final on the horizon, it may be a good time to play the Red Devils, who have been inconsistent on occasion this season despite the fact that they are on course to secure their best Premier League finish since the end of the Alex Ferguson era. Email “Why Liverpool could be competing for more than just a trophy in the Champions League final”. 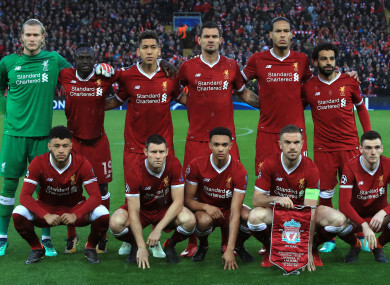 Feedback on “Why Liverpool could be competing for more than just a trophy in the Champions League final”.